THE DAWN OF THE DOUBLE! While making some investigations into rock and roll, THE DOUBLE was found! You’ve heard of the fox trot, you’ve heard of the twist, theres a new dance in town … The DOUBLE. DANCE THE DOUBLE! 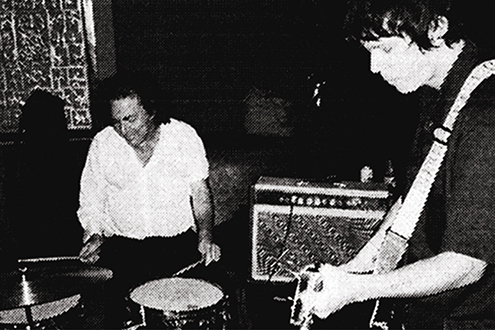 Jim White (Dirty Three / Xylouris White / Venom P. Stinger) and guitarist Emmett Kelly (The Cairo Gang / Bonnie ‘Prince’ Billy / Ty Segall) are THE DOUBLE. They’ve distilled THE DOUBLE’s essence into DAWN of the DOUBLE released on indie-record giant In The Red . “Dawn of the Double” was built by Emmett Kelly and Jim White, expert musicians able to craft work that’s rich with both nuance and range. Neither trait is apparent on first listen to “Dawn of the Double.” – LA Times . For the first time in Australia FEEL the sound that has set LOS ANGELES and NEW YORK alight, THE DOUBLE!